Perhaps Hollywood has finally grown as wary of the pathetic crop of modern action heroes as audiences have; this year’s action film trend seems to be resurrecting the badasses of decades past. While nobody is likely to top the pointless nostalgia of Stallone’s 80’s beefcake throwback, The Expendables, the violent-yet-sunny spook shoot ‘em up Red is no slouch on the geriatric star meter either. Bruce Willis stars as Frank Moses, a retiree living out what seem to be perfectly boring golden years in suburban America. Isolated and lonely, Frank has fallen in love with the only consistent human company in his dull little life - a voice at the end of the pension services hotline. Routinely ripping up his pension cheques as an excuse to call the equally bored Sarah, Frank eventually musters the courage to ask his unseen crush on a date. Though he doesn’t know it yet, Frank has lucked out on the dating scene because that call centre voice happens to belong to the completely adorable Mary-Louise Parker. On a slightly less lucky note, Frank’s romantic plans are soon dashed when a heavily armed wetworks squad descend on his provincial home and riddles it with bullets. Suddenly we discover that Frank isn’t the tragic elder he appears, as he singlehandedly takes down the entire team of assassins with little more than a dressing gown, handful of bullets and a frying pan. The violence is highly stylised and effectively brutal but with a smug absurdity that suggests the bloodshed is all fun and games rather than something to worry about. It is a bleakly comic tone that continues as Frank hits the road, forcibly kidnapping Sarah as he scrambles to stay ahead of an unknown enemy with seemingly limitless resources to hurt anyone connected to him. 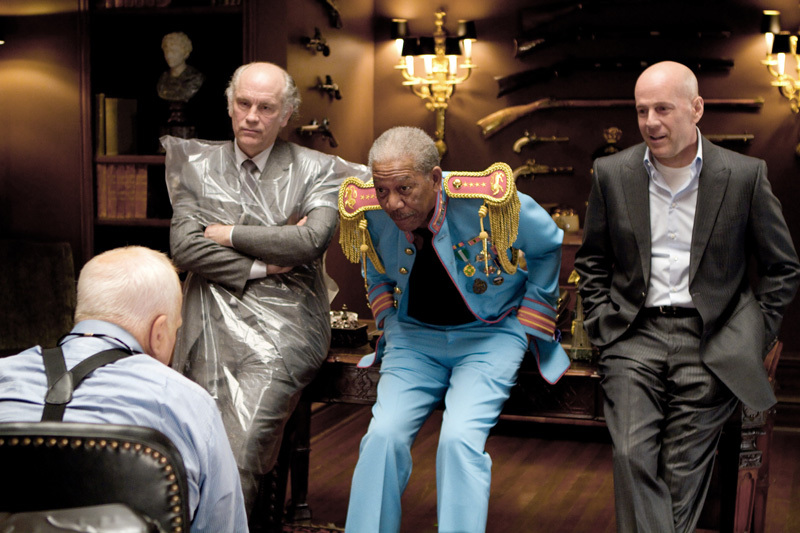 As the capable old timer begins to rope in a network of similarly matured cohorts – including an ever-reserved Morgan Freeman and hilariously deranged John Malkovich – his past as a top US intelligence agent is slowly unveiled. It seems Frank was once the best there was it what he did, and what he did wasn’t very nice. When he hung up his holster he was marked RED – retired: extremely dangerous – by the CIA. Now it seems something in his past has become a problem for someone very high up the governmental ladder and they would rather like it if Frank and his buddies weren’t around to tell any tales. The first half of the film is a harried road trip of crazy violence (like Malkovich exploding an inbound rocket-propelled grenade with in impossibly precise shot from his magnum) and awkward romance and camaraderie. It pivots midway to become a revenge flick, as the outgunned group of ex-spooks devise an Ocean’s 11-esque caper to get back at their powerful enemies. The film gallops with the childish glee of unchecked explosions and slapstick violence, never slowing down enough to become either boring or clever. The film’s obscure literary lineage, adapted from a comic book written by Warren Ellis, has been handled roughly in the transition to the big screen. Dry humour and subtle plotting is left behind for broad American gags and trite spy tropes. Kinetic, cheeky and fun, Red will appeal most to those with a fondness for the members of its impressive cast. Willis never really stopped doing these roles and you can’t throw a hand grenade without hitting several films featuring Morgan Freeman but seeing the likes of Helen Mirren and Richard Dreyfus back in the cheesy action saddle is a treat. Hell, the film even gives 93-year-old Ernest Borgnine a brief role as salt-of-the-earth records keeper in the CIA’s secret vault of secret secrets. As the only substantial cast member under 40, Karl Urban deserves mention as the CIA’s ruthless bloodhound, hot on the heels of Willis’s goodtime gang. He holds his own on the stage with some of Hollywood’s most esteemed actors and goes round for round with some of the scrappiest. That tremendously cool suit he wears might deserve a little of that credit, too. Red distinguishes itself as an action-comedy only because its contemporaries in the genre are so abysmal – it’s loud, occasionally amusing and for the most part makes sense. That’s upper quartile stuff these days. The film will work best for fans of the veteran actors who want to see them doing things they don’t often get to do these days, but it’s hard to imagine anyone being too offended by this breezy, volatile lark. 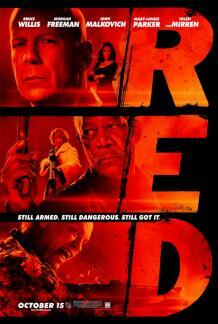 Red is in cinemas now.